It is hard to believe that another year is just hours away from being done. I think for many, 2017 was far from a perfect year, with natural disasters, flawed human choices, and news outlets constantly imparting the state of "crisis" our world is in. Combining this with personal struggles, a lot of my friends are happy to say, "Good riddance," and "Get behind me, Satan." My year was less than stellar, but I know I will try to look ahead to 2018 with more joy and hope than fear. This optimism seems a bit preemptive, I know, but as a Christ follower, my purpose is to find my fulfillment in helping to improve the lives of others. This upcoming year is one in which I hope to rewrite what those encounter me think of when they think of "Christians." It is the year that I practice what I preach when it comes to loving and guiding my children. It is the year that I will work to uplift those I meet with my actions, not just my words, and when my finances fail, I will offer my support with the gift God has called me to use over and over again–singing. My prayers for 2018 are that more people act and worship through their year the same way. We are not defined by our skin tone, our political affiliation, religious affiliation, marital status, wealth or lack of any of the aforementioned items. We are defined by how we treat people, in the absence and presence of witnesses-human and divine alike. 2018 is the year I hope trolling dies and people learn to respond with educated and well-thought out responses. It is a year I hope open-mindedness reigns, when we appreciate our differences and acknowledge our similarities. It is a year I look forward to seeing teachers actually embrace an unabridged history-where we stop glossing over uncomfortable truths, accept our past, and use it to heal and prepare our future. It is a year that I will encourage those around me (and myself) to step out of our comfort zones, safe rooms, and personal bubbles to listen to differing perspectives, asking questions and sharing how the dialogue or ideology impacts them instead of hiding behind the most dreaded words, "I'm offended," (which often means shutting down and closing off). These may be ambitious hopes and prayers, but I work through the One who taught us that we are to invite in the stranger, give drink to the thirsty, feed the hungry, visit the prisoner, care for the sick and clothe the naked (Matt. 25:34-40). In doing for others, we should rejoice in all that God has given us and Jesus taught us to use. We were blessed by Him in all our states to use what we had to make heaven possible on Earth (Matthew 5:1-11). I hope other Christians join me in reclaiming Christ as Christ would want us to; not through persecuting others because they are different, but opening our hearts and minds to all those around us. Let 2018 be the year we understand just because an oppression is not our oppression, it is still an oppression, that a sadness that is not our sadness is still sadness, and that an injustice though not our injustice is still injustice and as a community of Christ is it our duty and responsibility to stand for those are oppressed, weak, sad, alienated, sick and poor. That is what Christ asks of us every year. This is the year, I will continue to pursue being that Christian. The post 2018: The Year of Reclaiming Christ appeared first on Today I Saw God. "We have some exciting opportunities for volunteering with our student ministry. Ashley is currently seeking adult leaders for upcoming student mission trips, and she felt praise team members would be great in this role. Please contact Ashley or me if you want to discuss this in further detail with her." I thought, hey I am pretty busy with my praise team and consulting / handyman work and family, so I just said to myself, someone else will step up. I just received a message from Ashley Allen saying that, sadly, all Floris Youth Mission trips may have to be canceled due to lack of a sufficient number of adult chaperone volunteers." Again, I ignored the email. Hey, I said this time to myself, I have done more than 17 mission trips, and this trip would be with 6th, 7th and 8th graders what could they possibly do or for that matter, what could I do? I know can handle leading adults and High School age young adults on mission trips as I have done many times, but I'm sure someone else will step up. I hope this finds you well and enjoying the start of the summer! As you know,mission trip time is fast approaching for student ministries! Unfortunately, we are at risk of having to cancel all of our trips this year. This reality is painful to even think about. We have not yet had the leaders step forward this year that we need to honor our child protection policy for each of these trips which, as you can imagine is non-negotiable for us. Tim Wells shared your name as someone who is not only a willing servant but also might be available to go on one of these trips. We are in need of one more male to be a leader on our middle school trip with the Jeremiah Project to Romney, WV. I would be so grateful for your prayerful consideration of this opportunity. I know that you would be a blessing to our students and that you would also be blessed by serving with them. Please let me know if you have any questions. OK, OK, OK GODI hear you loud and clear! I need to put aside my pre-judging of what I THINK about leading a team of middle school youth and remember that I am being called to be part of something larger and that only God knows what that is, or will be. I picked up the phone and called Ashley – but only after extracting the splinters in my face from the 2×4 piece of lumber God hit me with and said to her – Yes I would go and lead the middle school youth. Stepping up to lead this trip was truly difficult for me. I have been actively engaged in mission trips since my first mission trip just three months after Katrina hit in Mississippi in August 2005 and spent Thanksgiving week in Bay St. Louis gutting homes inundated by 20-30 feet of storm surge. Since that first mission trip 12 years prior, I have been on at least 16 more mission trips, including multiple trips where I served as the construction lead or co-lead for high school youth and other adults. Still, I kept thinking what can 6th, 7th, or 8th graders do in a week and how can they possibly be a part of the Body of Christ that I had "labeled" in my mind as only inclusive to older youth and adults. I have a bad habit of pre-judging individuals and work daily to fight this sin. In this particular instance, God had other plans. I had a chance to present a talk at a recent Walk to Emmaus weekend about what makes up the Body of Christ and this trip to Romney, WV for the Jeremiah Project changed my view on who is the Body of Christ forever. Let's start with what is the Body of Christ? When we became Christians, we became new persons (2 Cor. 5:17; Eph. 2:14-16). We became part of a group of people with a common calling: to belong to Jesus Christ. No matter where we are or what we do or who we are, we are joined together like parts of a new body to reflect in the world the Christ in whose image we are created. This new body, comprised of all Christians, is known as the body of Christ (1 Cor. 12:12-20). You and I and all Christians everywhere make up the working parts of that body, the church universal. The body of Christ is, however, more than the community of Christians everywhere. This term also describes the church fulfilling its mission in the world. The body of Christ is the community of disciples united by faith in Christ and response to Jesus' call to "Follow me," to be the church wherever they are. The body of Christ continues Christ's ministry in the world today. d) wherever two or three are gathered in Christ's name. Who makes up the Body of Christ? The church is more than its building, its' organizational structure, and institutions, or its' appointed leaders. Though all of these are important aspects and features, sometimes people mistake these for the church. Instead, the church refers to all the people of God who, under the guidance of the Holy Spirit, seek to continue Christ's life and ministry wherever they are. The Body of Christ is comprised of both laity and clergy who are meant to support one another and work as a team. We should not expect pastors to carry an entire load of taking the gospel to the world. Laity is those who serve by being witnesses to the living Christ and carrying the gospel into their homes, workplaces, communities, and institutions that shape the lives of people. Clergy is those who serve by fostering Christian community, interpreting God's Word, administering the sacraments, and equipping the saints for doing ministry in their world. Both Laity and clergy are never in competition. Each individual Christian is an important member of the body of Christ. But it is important for individuals to form groups that can join resources to foster faith and act together to impact society. In the Bible there is no limitation on the age of whom the Body of Christ is to be comprised. The Christian family is also an expression of the body of Christ. Strong churches need the involvement of families, not just individuals. Families have been called the "domestic church"the place where people's lives are most deeply shaped. The family of faith has always been seen as the foundational setting for Christian education and faith formation. However, even though I was familiar with what Jesus had preached, I remained stubborn and continued to believe that middle-school youth were not really a part of the Body of Christ. By now you are probably wondering how that mission trip to West Virginia with the Jeremiah Project turned out? Well, it was held in a 4-H center, but without any air conditioning in the middle of July and every day was at or above 90 degrees! Furthermore, it was REALLY loud with a total of 71 middle school youth at the camp from multiple churches, but going on this mission trip was the best decision I have ever made and forever changed my view of who makes up the Body of Christ and what we can do as part of that Body. At the Jeremiah Project, they mix up the teams and leaders. I was assigned 5 youth for the week, but no co-leader. Normally, we rotate jobs Monday and Tuesday, with an off day on Wednesday, then work again Thursday and Friday and depart Saturday. Because of my experience in construction, our team was the only team that was assigned to work on one project for Monday and Tuesday while other teams rotated work sites daily. Our work included cutting pickets for railings, digging post holes, pouring footers, building stringers and supports to complete a 20' long ramp for wheelchair access from a deck to a gravel driveway. We finished our first project on Tuesday. Wednesday night, after we had our team day off to relax, I was called in to the construction leaders' office to help design an urgently needed low rise 8' length of stairs for an elderly woman, 82 years of age, who was on oxygen and used a walker. She has not been able to leave her trailer without assistance more than 12 years due to not having a properly sloped/constructed ramp. Her grandson would have to carry her out of the trailer when she needed to get out to doctors appointments. We could not build the 40' ramp needed due to lack of funds, but we could build something. I informed my team on Thursday morning that we were going to another location do build stairs/digging holes and framing and was greeted with "Mr. Scott, other teams are painting and landscaping.why can't we do these other jobs?" I said, we do what we are asked to do and serve as requested. We loaded up the van and headed to the home some 40 minutes away. During the trip I explained the project and the urgent need. There was silence for a brief second but immediately followed by grumblings about digging, rock removal, drilling and not being able to paint or landscape, as other teams were doing. When we arrived, we went inside this old trailer and were met by Ms. Emma (not her real name) and her grandson. She was seated in a chair with her oxygen tube and tank nearby. Introductions were given and then discussion started. She shared with us her life history, the medical and structural reasons for her confinement and thanked us for being there. Then, without hesitation, she told us that 6 months prior she had "died". She remembers being put in the ambulance at the top of her driveway and hearing the medic saying "uh-oh, this is not good". She was clinically dead until resuscitated by the EMTs in route to the hospital — and awoke in Winchester hospital. She shared about her seeing a bright light, feeling warm and not being afraid of death ever again. In fact, she was truly looking forward to reuniting with her husband and other family members who have preceded her in death and are waiting in heaven. Oh, and then she added that this was the second time she had died.the first time she died had happened six months prior. The entire room became completely silent (which was rare) as we, especially the youth, absorbed what we had just heard had been experienced by Ms Emma. That day we built the stringers, posts and cut all the treads and the youth worked tirelessly and efficiently. The day ended and I knew we would leave without having finished the project. But I was grateful to know another team would be there tomorrow to finish. We prayed as a team holding hands with Ms Emma. On the ride back to camp, my team, who earlier that day were begging to paint or landscape asked if I could request from the camp leaders if our team could return to finish the job on Friday. Our request was granted. We returned. We finished. Here is the result of our labor as the Body of Christ. 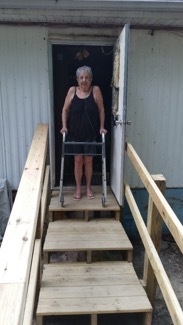 This is Ms. Emma stepping outside her trailer for the first time in nearly 12 years without having to be carried outside by her grandson. I am so glad that God hit me with that 2×4 in the face because it is important to remember, we ALL are the Body of Christ. Age and grade do not matter to God, only what we can do for others. The post The Body of Christ is Everyone, Including Middle Schoolers! appeared first on Today I Saw God. The first Christmas I remember was when I was four years old. It was also the first time I went to church after being invited by my childhood best friend and her family. I think it was a Christmas Eve event for children, complete with a children's pageant and nativity scene. I don't remember all of the details, but I do remember Mary, Joseph and the baby Jesus. Amazingly, I also remember what we sang that night: "Silent Night". And of course, I remember getting gifts and goodies. Going to a church on Christmas Eve wasn't a tradition for my family at that time. Even though there were tons of churches around us in Seoul, South Korea, my dad and his family were strong Buddhists. My mom was a Christian, but she couldn't go to church or even tell anyone that she wanted to go. The culture was male dominant and the father's religion was the primary one to be observed by the family. However, I was able to attend church with my friends during my early childhood, although I didn't know much about faith until later, when I was in upper elementary school. I remember I started praying for my family's salvation around that time, especially for my dad and grandma. My mom started sneaking out to the early-morning prayer service each day and because I was an early riser from a very young age, I started following her to the service. As Christmas approached, we would often see beautiful morning stars on very cold, clear winter mornings. I used to ask my mom which star was the one directing the Magi to baby Jesus. She always pointed to the brightest star in the sky and told me that one must have been it. I still regularly go to the early-morning prayer service and look up at the sky as soon as I get out of the house, just like I remember doing in my childhood. Especially this time of year, the memory becomes more alive when I see bright morning stars. As we have been learning more about the God of Surprises through this Advent, the idea of God as Emmanuel fills me with wonder. It's amazing that God would even think of coming down to earth as a baby and being born in a manger in the small town of Bethlehem through a virgin named Mary. But this surprising story doesn't end with an unexpected birth. As we all know, it leads to the Cross and the even more surprising resurrection. However, I think there is one more surprise that came just before Jesus ascended into heaven. He reminded his disciples that he came to save the world and told them what they needed to do. If I had been one of his disciples, I would have panicked at hearing the great commission: "Go and make disciples of all the nations, baptizing them in the name of the Father and the Son and the Holy Spirit." Because the disciples were all Jews who didn't associate much with gentiles and because they also grew up in local, small towns, they must have been shocked and maybe even a little frightened at the thought of doing what Jesus was asking. What would the great commission mean for them? What exactly was Jesus talking about when he said "all nations"? They didn't have a globe or map of the world. But they all accepted the great commission, as evidenced in the book of Acts. And because the disciples obeyed, the Holy Spirit opened doors and expanded their vision and understanding of all nations. What if they hadn't obeyed Jesus? Perhaps I would have never heard about Jesus in Seoul, South Korea. Between today's media and the Internet, we live in the most connected era of all time. Our physical view of all nations is truly global. However, I feel that our hearts' view of all nations has rather shrunk. Even though I get news from all over the world from my tiny laptop, I hardly feel for any of the people I hear about, even those in my own country. Especially in the busy hustle and bustle of Christmas, I hardly think of anything other than my church, family and friends (and if there is any wiggle room, maybe my neighbors). When I was preparing last summer for this year's Christmas cantata, God strongly reminded me what truly needs to be celebrated. Jesus came to earth to save the world. John 3:16 clearly tells us that, "For this is how God loved the world: He gave his one and only Son, so that everyone who believes in him will not perish but have eternal life." Have you thought about what God really wants for Christmas? I have, and I truly believe that he wants all of us who live on earth to have a relationship with him, calling him Father through the salvation in Christ Jesus. I pray that this year's Christmas cantata worship services will help open our hearts to receive the meaning of Christ's humble birth. You will hear carols from all over the world. I would like to invite you all to be a part of this celebration and to invite your neighbors, particularly those from countries where Christianity is not the primary religion. I also want to encourage you to go beyond the invitation and open your eyes to see who they really are. Who knows if there is another Yoon for whom this could be the first Christmas experience and who will grow in faith through this simple invitation? This could be our first step in following the Great Commission. The post What God Would Want for the Christmas? appeared first on Today I Saw God. It's that time of year. Earlier this week I stopped to pick up butterscotch krumpets for my father-in-law and saw the familiar red kettle and heard the distinct bell ringing-the Salvation Army is out in full force. I stood in the checkout line and smiled as I watched the man in front of me ask for change. I knew exactly where he was going. Recently I discovered that the Salvation Army has its root in Methodism. In 1865, William Booth, a Methodist pastor in England, and his wife Catherine wanted to bring salvation to the poor by meeting both their physical and spiritual needs. I also found out that the red kettles started in San Francisco in 1891 to raise money to feed 1,000 people Christmas dinner. The sight of the Salvation Army brings back fond childhood memories for me. I remember my father arranging the "adoption" of a family each Christmas. The family would provide a list of gift ideas for their children. Dad would tell my sister and me how much we could spend and then let us select the Christmas presents for the kids. I remember so clearly how fun it was to shop for someone else at Christmastime. The parents never provided ideas for themselves so Dad would purchase hats and gloves and all the fixings for a Christmas dinner. I remember how much the parents appreciated that we thought about them. I still think about how it felt to bring happiness and joy another family at Christmas. Seeing the volunteer stand next to that red kettle also reminds me of the times I stood on the corner of Main Street in downtown Annapolis ringing that bell in the freezing cold. I vividly remember the joy I felt when someone would drop something in the kettle, but also the sadness when people would not even smile or look my way. These memories are why every time a see a "ringer" I make sure to drop money into the kettle, look them in the eye and say, "Merry Christmas." Those red kettles and bell ringers are a reminder to me that Christmas is a celebration of the birth of Emmanuel, God with us, a light of hope and love in what can sometimes be a dark world. The post 'Tis the Season appeared first on Today I Saw God.